e is for book: School Visits with eBooks? 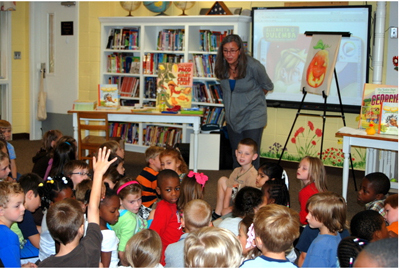 Last Fall I spoke to an elementary school in Auburn, Alabama. As usual, I asked the media specialist if she wanted me to concentrate on one of my titles to tie in with school activities. "Yes," she said. "Lula's Brew. I've been sharing it with the kids and they love it." 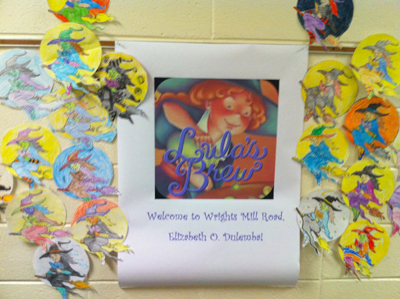 They even used one of my coloring pages to get fired up about Lula and my visit to their school. Aren't these cute? One hiccup, Lula's Brew is an app. How in the world was she sharing it with the classrooms of 20 kids or more, especially considering one of the biggest arguments against eReaders was that you couldn't share them with a group? Turns out, she used a projector to broadcast Lula's Brew from her iPhone to the library's Smart Board. And then she'd read along. So for my visit, she projected the iPhone version onto the Smart Board behind me, while I shared the iPad version which I held and read. Sadly, I didn't get a photo of the reading in progress, but you can see the set-up in this shot. So glad you wrote this post. I did a school visit yesterday and wondered what it would be like when my OP book is an app. I am also glad to hear the media specialist made it all work. Probably helped the kids not sprout green scales. Interesting post... Some articles I've read suggest that iPads are becoming increasingly popular in schools... I think we still have a long way to go. And I'm not quite ready to even imagine a school without traditional books, but I can imagine some combination. Congrats Elizabeth, for being on the cutting edge! Lovely post. This set up is not much different than the old Weston Woods filmstrips, say, so I don't think the audience would think it that far out. But it sure proves that apps designed to be on small, personal gismos aren't limited to that. Elizabeth, you are a trail blazer on many fronts! Great Post. You are really incredible. What a creative way for the kids to be able to see the book.It is really going to be interesting to see all of the changes coming with children's books. You are indeed a trail blazer! Cool. And yes, I don't see any difference between this and the projectors that the public library used to read to all the kids on Saturday morning when I was 6 (ie 1969)... instead of a small ebook reader or iphone, they had a small paper book... So I guess the kids wouldn't be surprised in any manner. :) And if it moves... well they're very used to movies and apps on computer screens. I do think it is GREAT that you are getting so much exposure for the book and app... it is self-published??? And so great that the librarians (media specialist?) are on the ball re the technology to share the stories with kids.